Open Keyman Configuration, from the Keyman menu in the Windows taskbar. Click English in the 'Display in:' menu on the top right corner. Select your language from the list. 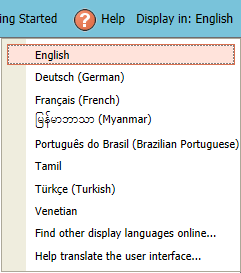 If your language is not in the list, click Find other display languages online…. If your language is not available online, you can write your own translation for your language using our local editor. For more information, see The Locale Editor - Translating the Keyman Desktop User Interface. Restart Keyman Desktop for the language changes to take effect for the entire program.